Thank you for my guffaw laugh this morning. I loved it! Having worked in a prison, I can say you are absolutely right. They are not given belts -- however, their pants generally fit. 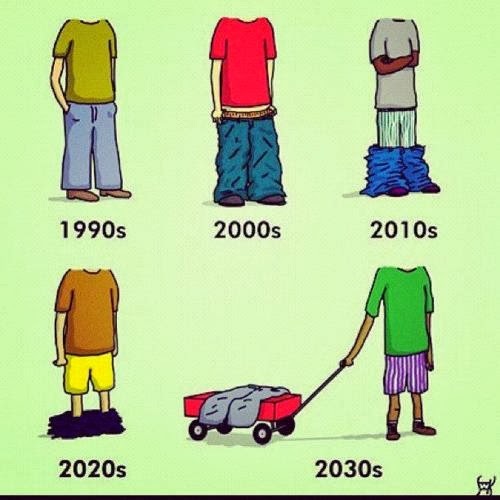 But their "hommies" on the outside, who wear baggy pats as style, started going without belts too as a homage to their fellow gang members serving time. So, that I get. so funny that we were both thinking of this today. and THAT was the best audition ever! I remember that. How interesting! I didn't know where this trend originated from. Sometimes I forget our trends always come from somewhere. My favorite reason for pants falling off is the number one reason of course! So funny! I think so too!! Really ridiculous lol and I wonder whether these young men will look back in ten years and cringe at their poor fashion choices? Wouldn't people from 100 years ago be shocked at society today? ?